Martha Aileen Ewing, age 81, of Cicero, IN died June 4, 2017 at Miller's Merry Manor at Tipton, IN. She was born June 21, 1935 at Newport, IN to Clarence and Kathryn (Jenkins) Bishop. She was a graduate of Manual High School at Indianapolis, IN. her family. Martha was an artist working with acrylic paint, a seamstress, and fun times found her ballroom dancing. She was a member of Cicero Christian Church. she was also preceded in death by a brother: Jerry Bishop and her step-father: James Goldman. great-grandchildren: Bryce Cheetham and Collin Cheetham. Memorial services will be held Monday, June 12, 2017 at 6:30 P.M. at Hartley Funeral Homes Cicero Chapel with visitation from 5:00 P.M. until time of the services. Memorial contributions may be made to the Parkinson's Association. 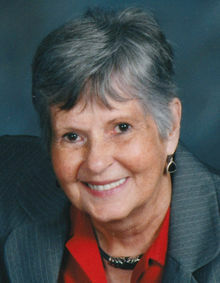 You may send condolences at www.hartleyfuneralhomes.com. Add Photos, Videos, Music that tell the story of Martha's life.